Ready for an adventure? Then suit up for an experience like no other. 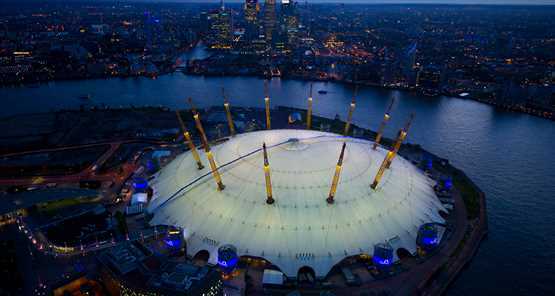 Up at The O2 takes you on an exhilarating 90-minute climb over the roof of the world’s most popular entertainment venue. As one of our intrepid explorers, you’ll climb all the way to the top of The O2 via the walkway, suspended 52m above ground level. Kitted out with a climb suit, boots and harness you’ll be very inch the urban mountaineer. Our climb guides will be with you every step of the way. Are you ready for an unforgettable adventure? Also see a different side of the city, by day, at twiligt or sunset! Please remember that under 18s must be with an adult in the ratios shown in 'Important Information'. Check this before you purchase. Such a great experience, our guide Nat was first class and made for a super fun climb. It’s less strenuous than you could imagine and even if you have a phobia of heights, the canopy of the O2 below masks the actual height you’ve climbed. Stunning views from the platform on top of the O2. Can’t recommend enough. We all loved it. Really easy to purchase. Made booking received email confirmation almost immediately and tickets the next day. Turned up, got kitted up and climbed. Really easy. Would recommend. Fabulous thing to do with my teenage son. Guide made it for us such a great sense of humour and very knowledgeable but always safety was priority which made the experience and the sense of achievement fabulous! Well worth a visit! Everything great - from welcome, safety brief, equipment, climb and return. Staff very welcoming and Ross, our guide, very supportive of our family member requiring additional support - really made for a great family event. Recommended! Great site and a good discount. O2 weren’t worried about us signing the voucher, we just showed it them, they ticked us off on their list, handed us back the voucher and off we went. Great experience, would recommend it to anyone. Excellent staff and a very enjoyable trip. Loved the climb!! Wonderful in the sun - even an 81 year old loved it for her birthday challenge ! Fab family day out!! Would definitely recommend to anyone! Very efficient, safe and the views were great! We would definitely climb again! Took my son and his friend for his 9th Birthday. We all had an amazing time, brilliant view! Awesome customer service and a fun morning! Such a fun experience! Satchet was great and patient with the group. We didn’t feel rushed at all and thoroughly enjoyed the experience despite the rubbish weather! Climbed the O2 on a cool but sunny day and had an amazing experience.